The companies secure within colonial territories made more capital investments in land, stores, and shipping. A major item was the shift from wind power to coal in propulsion and from wood to iron in ship construction. In many ways sail was still more suited to Pacific conditions. Distances were great—some 6,500 miles from San Francisco to Sydney. By then more information was available on favorable winds and currents for passage planning under sail, where calms had always been of more concern than storms. The early steamships, carrying around 1,500 tons of cargo, were disadvantaged, as they burned about thirty-five tons of coal per day to give a speed of seven knots. This meant coaling stations were required across the Pacific, including Honolulu (2,100 miles from San Francisco), Suva (2,800 miles from Honolulu), and to reach Sydney, another 1,700 miles away. Coal was expensive whereas wind was free. Bunkers took up cargo space and added weight, as did the engines, which required spares, skilled engineers, and technical maintenance. Coal in turn had to be brought to bunkering ports by other ships and stockpiled. By the 1870s there were bigger steamships with more efficient engines, requiring a coal consumption of fourteen tons per day at nine knots. Sail then focused internationally on low-value bulk but continued on some Pacific routes. In the island trades the strategies adopted by several companies were to continue using sail for the long-haul supply ships from main ports, ultimately with auxiliary engines, and steam vessels for trading permanently around the islands, for a time with auxiliary sail. The advantages of steam and diesel propulsion in the islands included improved schedules, greater maneuverability in reef areas, ability to work clear from a lee shore, and the facility to leave lagoons regardless of wind direction. On Chong [Trading Company] employed the barque Loongana for the 2,500-mile passage from Sydney to the north Gilberts, and steam vessels such as the St. George for trading around the islands. It was such a successful division that when the Loongana was lost, she was replaced by the sailing ship Alexa, until she too was lost in 1924. The managers of the major merchant companies based at the main entrepôts in the [Pacific] islands were often ex-sailors. Several acted as consuls for their governments and supported the companies in many ways, including evoking gunboat diplomacy. A prime example is John Bates Thurston. He served at sea in the island trades, was wrecked at Rotuma in 1865, became British consul in Fiji in 1867, was highly influential in the negotiations for the ceding of Fiji to Britain in 1874, and became governor of Fiji in 1887. The companies, the new settlers, and their sympathetic consuls pressed for annexations. The French were the first to act [but Waitangi was 1840—J.] and took Tahiti, the Marquesas, and the Tuamotus as French protectorates in 1842 and New Caledonia in 1853. These were declared colonies in 1880, and the Australs and Wallis and Futuna in 1887. The British annexed Fiji in 1874 and established protectorates over southeast New Guinea in 1884, Gilbert and Ellice in 1892, most of the Solomons soon after, and Ocean Island in 1900. They agreed that New Zealand would exercise authority over the Kermadecs in 1887, the Tokelaus in 1889, and the Cooks and Niue in 1901. The Dutch took western New Guinea in 1848. Germany annexed northeast New Guinea in 1885, along with the Bismarck Archipelago and the northwest Solomons; took possession of most of the Carolines in 1885; and ultimately purchased Yap and other islands in the Carolines and Marianas from Spain in 1899. The Germans also acquired the Marshall Islands in 1884 and took over Nauru in 1888. Chile obtained Easter Island in 1888. America, after its disastrous Civil War, had not recovered a significant merchant fleet and showed little inclination for acquiring Pacific territory. American guano companies had already secured legislation in 1856–1860 that allowed claims over some small Pacific islands, and the US government went on to secure others, including Baker, Jarvis, Johnson, Midway, Palmyra, and Wake. In 1893 the influential American maritime geostrategist Alfred Mahan wrote that it was "imperative to take possession, when it can be righteously done, of such maritime positions as can contribute to secure command." In 1898, Hawai‘i was annexed (US citizenships were granted in 1900), as was eastern Samoa with Pago Pago as a main naval coaling station, while Guam was captured from Spain by the US Navy in 1898. The Pacific was now effectively divided between several colonial powers mainly by agreements. In the final carve-up, it was confirmed that Western Samoa was a German colony separated from American Samoa in the east. In turn Germany agreed to relinquish claims for Tonga. As a result, in the closing days Tonga appeared to survive as the only independent Polynesian kingdom, although not quite. It was declared a British protectorate in 1900, and in 1905 it was decreed mandatory for the king of Tonga to take advice from the British consul on all matters of importance. Finally, in 1906 New Hebrides was divided as a condominium between Britain and France. Labels: Britain, Fiji, France, Germany, Hawai'i, Micronesia, Netherlands, Pacific, Papua New Guinea, Polynesia, Spain, U.S.
Lu: "Ol skulmanki i amamas nogut tru bilong wanem sikul i pinis nau ... na ol papamama i amamas long mi kisim ol i go bek long ples ... Ol i save dispela ka i no bagarap long dispela rot ... Oyes, ol i save Isuzu em i gutpela ka tru ..."
Lou: "The schoolkids are awfully happy because school is over now ... and the parents are happy for me to bring them back to the village ... 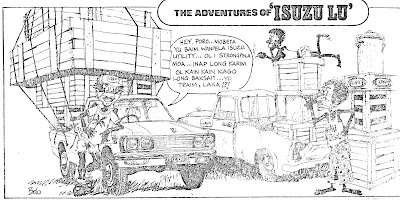 They know this car won't break down on this road ... Oh yes, they know Isuzu is a very good car ... "
This is a scan from a faded old photocopy of a cartoon ad by Bob Browne for New Guinea Motors in the Papua New Guinea Post-Courier, 1976. I've got a lot more, but I'll have to limit my scanning to just a sample because I see that the author/illustrator has published a collection of these cartoons. I just bought the last copy of Isuzu Lu Book 5 available on Amazon.com. Tok Pisin with Isuzu Lu: Hey, Poro! Lu: "Hey, Poro ... Mobeta yu baim wanpela Isuzu Utility ... Ol i strongpela moa ... inap long karim ol kain kain kago long baksait ... Yu traim, laka!?!" Lou: "Hey, Friend ... You'd do better to buy an Isuzu Utility ... They're very strong ... enough to carry all kinds of cargo in back ... Try it, okay!?!" As a result of continued shortages of crew, British and American ships frequently sailed shorthanded for the Pacific. The trips involved passages that were four to five months long, via the Cape of Good Hope or Cape Horn. American ships sometimes picked up a few sailors in the Atlantic Islands but generally shipowners were not unhappy with depleted crews, which reduced labor costs during these unproductive legs of voyages. Not so for the disgruntled seafarers whose lives were endangered from shortages of experienced shipmates in bad weather and when beating around Cape Horn against strong headwinds. Captains clearly preferred Pacific seafarers, who were used to compliance toward chiefs and thus unlikely to give captains trouble by demanding seafaring customary rights on board. The islanders were useful too as interpreters and understood the Pacific ways of trade. As sailors they were skillful at handling loaded boats through heavy surf when ships had to stand off and on. On whalers they acquired reputations as good harpooners and for boldness in closing on a whale. The keen eyesight of island sailors earned them the tobacco bonuses for spotting whales, and this, along with reading the signs of the sea for sudden squalls and reefs, made them invaluable as masthead lookouts. Swimming and diving proved other important assets. Turnbull was impressed when, on approaching Hawai‘i, he encountered people a mile offshore supported only by "a thin feather-edge slice of wood." He refers also to Hawaiians diving from topgallant yards and swimming under the ship. This skill of deep diving was employed on pearling and bêche-de-mer ships, as well as for making underwater hull repairs and clearing fouled cables. The extent to which island men and women were at home in the sea is further alluded to in dramatic rescues. Copping describes how, when the Harriet of Sydney was totally lost near Te Puna in April 1840, "the crew would have been lost also if it had not been for the Maori women on board the ship swimming them ashore." He relates also that when his own whaleboat broached to, and he was knocked overboard and trapped under the boat, a shark "lay hold" of his shoulder, but "my harpooner a Maori jumped overboard after me." Similarly when James Bagley fell from the topgallant crosstrees, a Hawaiian seaman, John Mowhee, dived after him and told Bagley to hold on to his shoulder until they were rescued. For the shipowners a more compelling reason for employing Pacific seafarers was their lower costs in wages and victualing. The whaleship owner F. Parbury, who gave evidence at the British House of Lords Select Committee on the Navigation Laws, readily attested to this and expressed preferences for New Zealand (Maori) crews. Labels: Britain, economics, Hawai'i, labor, Pacific, Polynesia, travel, U.S.
Of all the orgies imaginable it was here. There were nearly 100 men, mainly deserters from different ships, drinking, singing and dancing, and fighting. The captains used to come ashore and get their men but dare not touch one. So when a ship wanted hands, two or three captains would come ashore and be hail fellow well met, call for a quantity of their detestable grog, get them nearly all drunk; and at night kidnapped as many as they wanted. An' a bloomin' big head, an' a dose of the pox. Kamehameha died in 1819 at the age of about sixty-six. His fleet of foreign-going ships probably never made adequate profits, even though most of the capital and operating costs had been derived from the extraction of natural resources, with free Hawaiian labor ashore. Most of the voyages to China by his ships were ruinous, at least partly due to the unscrupulous agents and merchants in Canton, lack of care, recurring repairs and delays, and related payments of high port dues. His son Liholiho (Kamehameha II) faced increasing debts, as resources from land and sea, used for financing these ventures, had appreciably decreased. Despite mounting debts the new king went on to purchase more ships. His first acquisition, at enormous cost, was the luxury yacht Cleopatra's Barge (191 tons), bought from the American millionaire shipowner George Crowninshield Jr. Renamed Haaheo O Hawaii (Pride of Hawai‘i), the ship cruised around the Hawaiian group with the royal family and leading chiefs until 1825, when it was wrecked. It was reported that the ship at this time was "manned by a drunken, dissipated, irresponsible crew from the captain down to the cabin boy." About the same time, the ship Prince Regent, which Vancouver had promised as a gift, was also wrecked after less than one year in service. To add to the problems of the royal family, news was received in 1825 that the king and queen had died of measles on a visit to England during 1824. They were there to elicit British political support and in the process incurred considerable expenditure. The family, now with a boy king (Kamehameha III), faced numerous creditors, and with sandalwood and pearls exhausted, a bold maritime venture was conceived to solve these financial problems. Governor Boki of Oahu and Chief Manui‘a of Hawai‘i were to sail for Erromango in Vanuatu and acquire the still plentiful sandalwood of that region for carrying to China on Hawaiian ships. Chief Boki was in effect to occupy Erromango as ruler in a Hawaiian attempt at colonization. They sailed on 2 December 1829. Boki was in charge of the royal warship Kamehameha with a complement of 300 people, including 10 foreigners, Hawaiian sailors, soldiers, servants, women, and some other Polynesians. His navigators were Blakesly (a watchmaker) and Cox (a silversmith), possibly neither being qualified in navigation or experienced in seamanship. Manui‘a was in charge of the Becket, with 179 people. His navigator was more sensibly a former mate of a whaler. The last foreign-going vessel independently owned by the Hawaiian royal family was the schooner Kamehameha III (116 tons), which sailed to California in 1848. However, the French Navy commandeered the ship in response to a complaint by its consul in Honolulu regarding unfair treatment of French business interests by the Hawaiian authorities. The following draft of a paper was presented at the Fourth International Conference on Austronesian Linguistics (FoCAL), in Suva, Fiji, in August 1984, under the title "The Balkans and Papua New Guinea: Language Contact Issues." It briefly touches on some of the new (and disturbing) ideas about Sprachbund issues that I encountered during my Fulbright year in Romania in 1983–84. It was a frustrating year for linguistic research, but a wonderful year for language learning—and for travel, it being my first trip to Europe. The Balkan Sprachbund may receive more publicity than its counterpart in Papua New Guinea, but in neither area are the issues anywhere near resolved. I intend here to outline some of these issues and to compare the progress being made toward resolving them in each of the two areas of study. The Balkans will receive greater attention because I assume that most Austronesianists are less familiar with that area. The core of the Balkan Sprachbund is composed of five languages: Albanian, Bulgarian, Macedonian, Modern Greek, and Romanian. Compared to the hundreds of languages involved in New Guinea, the number seems quite manageable. Moreover, Bulgarian and Macedonian are sufficiently close that they can be considered together for most purposes. More peripherally involved in the Balkan Sprachbund are Serbocroatian and Turkish. Turkish is usually considered only as an outside donor language, but it would be interesting to compare Balkan or western Turkish with eastern dialects or with other Turkic languages to see to what extent it may also have acquired Balkan, or at least European features. The surviving languages of the Balkan Sprachbund, then, all belong to different branches of Indo-European. For most of these branches, there is some documentary or comparative basis for sorting out areal features from genetic features. (Comrie 1981:198.) Matters are considerably complicated, however, by the knowledge that the original Balkan substratum did not survive. The most common terms used to refer to this substratum are "Thracian", "Dacian", and "Illyrian". No one is sure whether these are different names for the same language, different dialects of the same language, or three different languages, each with separate dialects. Assumptions vary from linguist to linguist. So does the importance assigned to the role of the substratum in accounting for the similarities shared by the present-day Balkan languages. I shall discuss the substratum issue in greater detail shortly. Early studies of the Balkan languages taken as a unit perhaps tended to overstate the similarities among them. Sandfeld, in his classic synthesis on the subject (1930), says that, "in going from one of these languages to another … one is struck by the fact that the manner in which things are expressed remains essentially the same throughout the entire territory covered by these languages" (1930:6-7; Grace's [1981:27] translation). First, let me illustrate the kinds of explanations I had hoped to find, by briefly summarizing the loss of the infinitive. In the Balkan languages, finite verbs are used where other European languages would use the infinitive. The loss of the infinitive in Greek can be explained on language-internal grounds. Loss of word-final [n] in Greek made the infinitive formally identical to the 3d person present indicative form of the verb. Distributional evidence suggests that this innovation spread north from Greece. Bulgarian lacks an infinitive entirely. Citation forms of verbs are usually 1st person present indicative. The infinitive exists in Albanian but is used more in the northern dialect than in the southern one. In Serbo-Croation, Serbians prefer to use subordinate finite verbs where Croatians use the infinitive. In Romanian, too, more northern dialects use the infinitive more than the southern ones. I believe there is general agreement on this question. Unfortunately, not many other issues are as well resolved. One can say almost the same thing about some areas of Papua New Guinea, but only where the languages involved are all from the same family. The convergence between AN and Papuan languages is on a much grosser level, at least in most cases. More recent work on Balkan languages, especially that by scholars from the Balkan countries themselves, seems to pay more attention to the differences among the various languages. One reason may be that the Balkan scholars have a greater concern for questions of their own national identity than did the outsiders who originally popularized the concept of the Sprachbund. In fact, Dumitru Macrea, a Romanian scholar, has expressed the view that the whole concept of a Balkan linguistic union being somehow comparable to a language family had its origin in the desire of Germany and Austria to propagate the idea of a unitary Balkan area which those powers then planned to dominate politically, economically, and culturally (Macrea 1982:284). Another reason more recent scholarship may emphasize the differences among the languages is that there is simply much more data available than there used to be. Finer differences have become more salient. The same thing is happening with regard to Papua New Guinea languages too, as more data becomes available. I suspect that detailed study of the Kupwar village languages would also turn up many, many cases in which those languages are not as perfectly intertranslatable as they are often assumed to be. Even if many texts are morpheme-for-morpheme translatable, I suspect comparable morphemes are never full synonyms. This raises an important issue. Is absolute convergence necessary? Is it desirable? Is it even possible? What kinds of differences are most tolerable? If fluently bilingual speakers maintain one of their languages solely for emblematic purposes, that is, solely to mark themselves off from speakers of other languages, what portion of their language will serve that emblematic function? Will they be content to say, “You say tomayto and we say tomahto,”, or “You call it eggplant and we call it aubergine”? Or might they also focus on larger differences, like “You put object complements before the verb and we put them after,” or “You have all those heart idioms and we have all those liver ones”? Virtually any recognizable difference would seem sufficient to be emblematic. What is it that accounts for the unity that does exist among the Balkan languages? It is significant that no mention at all is made of the possibility of a common Balkan substratum in two recent general works in English that devote some attention to Balkan areal features. These two works are Comrie's (1981) introduction to typology and universals and Bynon's (1977) textbook in historical linguistics. Bynon mentions the Byzantine Empire and Greek Orthodox church as unifying factors, while Comrie emphasizes the mutual bilingualism that enabled innovations to spread across language boundaries. Schaller's (1975) introduction to Balkan linguistics (in German) also tends to discount the role of the substratum and appeal more to the Greek and Latin adstrata as unifying factors. The over dependence on substratum by earlier linguists to explain language change seems to have made many western linguists shy of using the term. Substratum is generally given a more prominent role, however, by those linguists for whom it is not just an academic issue but also a question of national ethnogenesis. Romanian linguists, for instance, often talk of the history of their language in geological terms. Romanian is said to consist of an autochthonous (pre-Roman Dacian) substratum, a core stratum from Latin, and a superstratum of Slavic. To some, the central problem in Balkan linguistics is the identification of pre-Roman, pre-Slavic, autochthonous elements in the Balkan languages (see Brancus 1978). In spite of much effort, not much progress has been made in this direction (Brancus 1978:374). The only records we have of the Dacian language are a handful of proper names and between 10 and 20 Dacian glosses in two Greek lists of medicinal plants (Academia R.S.R. 1969:314-316). Al. Rosetti, the Romanian linguist who has concerned himself most with Balkan linguistics in the broader sense—that is, the study of the Sprachbund as a whole, not just the attempt to reconstruct the pre-Roman substratum—nevertheless uses the term "substrate influence", rather loosely to designate any sort of interference between two languages (Rosetti 1978:205). This perhaps parallels the use of loaded terms like "mixed language" or "language mixture" to describe any sort of contamination between AN and Papuan languages in the New Guinea area. Gheorghe Ivanescu, one of the principal Romanian Indo-Europeanists, holds a fascinatingly particular view that requires a substrate motivation for each and every sound change. He attacks the "neolinguist" view that phonetic changes are imitative and therefore transferable across language boundaries (1980:735). He asserts instead that a phonetic change is realized only by a change in the "base of articulation", that is, by a change in the characteristic shape of the oral cavity at rest within a given population (1980:8). He attacks the structuralists for failing to recognize the innateness of certain articulatory tendencies, and suggests that phonetic similarities between some Caucasian languages and Romanian (such as the presence of phonemic schwa) "are to be explained by the anthropological relationship between the peoples of the Caucasus and those of the Carpathians" (1980:733). An interesting corollary of Ivanescu's view is that languages do not change at a constant rate. Instead, language change depends on external changes in the speaker population. The "base of articulation", for instance, changes over time "through changes in the quantitative relationships between the component human types [of a population], as well as through mixtures with other populations, maybe even through biological mutations between one generation and the next" (1980:9). A "natural" economy, however, does not allow languages to attain their "natural" condition. In a "natural" economy, divergent local bases of articulation are free to influence phonology, while divergent local temperaments are free to influence morphosyntax (1980:13). These influences are "completely avoided only in eras of intense circulation" of people and goods, thus in eras of higher technological development when unitary literary languages are born (1980:13). "[O]nly in such eras can languages completely attain their natural condition: that of relative stability" (1980: 13). I have already mentioned Macrea's opinion that Germanic imperialism is responsible for propagating the Sprachbund idea. Macrea (1982:285) and Ivanescu (1980:48 ff.) see similar forces at work in an early hypothesis that attempted to explain the particularly close similarities between Romanian and Albanian. The hypothesis was that the Romanian language and people originally took shape south of the Danube close to where the Albanians are now. A corollary assumption is that when the armies of the Roman Empire retreated south of the Danube in A.D. 275, the whole Romanized population came with them. One can see why this hypothesis would weaken the historical argument for Romanian territorial claims. Although this hypothesis is still kept alive by some Hungarian irredentists (see Du Nay 1977), it is no longer considered seriously by any present-day Romanian linguists. Instead, Romanian linguists are inclined to attribute the similarities between Romanian and Albanian to a common Thraco-Dacian substrate, on the theory that the Romanians continue that portion of the substrate population that adopted Latin as its mother-tongue, while the Albanians continue that portion that borrowed a lot from Latin but did not switch over to Latin (Ivanescu 1980:57). Romanian linguists, then, are far less reticent than their Western counterparts about appealing to a common substratum as a unifying factor in the Balkan Sprachbund. I believe that part of the appeal to substratum as an explanatory factor is motivated by the desire to establish prior territorial claim to present Romanian-speaking areas. So far, historical linguistics in the New Guinea area has been relatively free from involvement in territorial claims. I hope that situation continues. (4) widespread bilingualism (Saramandu 1979). Saramandu (1979), a younger Romanian Balkanologist, distinguishes what he calls "passive" and "active" bilingualism. The distinction is not unfamiliar, but I would use the terms "restricted" and "unrestricted" to describe the two types. By "passive" bilingualism, Saramandu means bilingualism restricted to certain social occasions (religious services, for instance) or certain social strata (priests, administrators, itinerant merchants or craftsmen). The mass of the population would presumably recognize but not use another tongue. By "active" bilingualism, Saramandu means the bilingualism of a person who masters and uses two or more languages in more or less equal measure. I'm not sure that, for a given population, the end result of either of these types of bilingualism would be very different, except that the second permits the possibility of complete language shift. On an a priori basis, one might suppose that the foreign languages in which a population is passively bilingual might contribute more loanwords or loan translations, and have less effect on phonology, morphology, or syntax; while the foreign languages controlled actively by the mass of a population would influence the phonology and phraseology as much as the lexicon. But French, for instance, seems to have penetrated into every corner of English (except perhaps phonology) even though the great mass of Anglo-Saxons after 1066 were certainly no more than passively bilingual. If sufficiently influential, active bilinguals can spread foreignisms among their own passively bilingual kith and kin at least as efficiently as foreigners can. Here ends the draft of the paper I presented but never submitted for the conference proceedings. The only record I preserved was a hand-annotated printout from the Wang word processor at the accounting firm where I was working (the Honolulu office of Deloitte). Unfortunately, the bibliography seems to have gone missing. I scanned, OCRed, and then cleaned up those pages to get the text above. My wife and I began that fascinating year teaching summer extension courses in Yap, Micronesia, during a severe drought that had us bathing out of buckets in our air-conditioned hotel room. Little did we realize at the time what types of shortages we would face during our long, cold, dark winter in Romania. We both made the trip to Fiji, where we stayed in a village near the conference hotel, along with several other participants from far corners of the globe. For the two of us, especially after Romania, that Pacific Island village made us feel we were back home again. After the Third Plenum of the 11th Central Committee, our country’s financial revenue gradually declined in proportion to the gross national product, while expenditures steadily increased, thus resulting in a deficit. This was the price we had to pay; it was normal and solvable. In 1984, I began proposing a gradual raising of the revenue-to-GNP ratio. To reduce the deficit, we temporarily scaled back infrastructure construction and reduced the pace of economic development. There was no other choice. If we had ignored the situation and launched an “all-out fast-paced campaign,” we would have faced seriously high inflation and put greater strains on farmers and workers. The readjustments in 1979 and 1980 and again in 1981 had been necessary. As a result of the 1981 readjustments, the agricultural sector continued to enjoy big harvests, the market continued to prosper, and the nation’s economy showed no negative growth. On the contrary, the economy grew by an annual rate of 4 percent. And as the readjustment deepened in 1981, growth increased. The growth rate in the first quarter was relatively low, the second quarter was better, the third quarter was higher, and the fourth quarter was significantly higher. This proves the readjustment was good and the economy had recovered. Here’s how we kept the economy growing: by scaling back infrastructure projects and reducing heavy industry, iron and steel production, and machinery production; by expanding light industries such as consumer products and textiles while allowing and encouraging private businesses; by developing service industries. The cities continued to prosper and living standards continued to rise. Employment rates rose. In the end we achieved a balanced budget and the people were generally more satisfied. That said, the policy had its shortcomings. We still hadn’t entirely corrected the traditional way in which the Planning Commission cut back on infrastructure projects, which was to “cut straight across the board.” With the old system still in place, it was hard not to do so, and so we set quotas for each region. Still, in retrospect, the readjustment was too severe. We should have made exceptions for all projects where equipment had already been received or was urgently needed and could be installed and put into production quickly. This would have been more cost effective, particularly if you consider the cost of storage. Even though some of these projects resumed a year later, time and money was wasted. Some of the projects took years to recover. The reason we didn’t take more flexible measures was mainly because we lacked sufficient domestic funds to pay for these projects; the deficit needed to be reduced so that a financial balance could be achieved. It was all too mechanical. For example, if the deficit had not been eliminated immediately and some of the budget had been spent on worthwhile projects, the investment could have been returned in a year or so. And under the open-door policy, we could have resolved the problem by taking out more foreign loans. But Chen Yun was concerned and firmly insistent. He was afraid of excessive and overly large projects and insisted on the reductions. At the time, there were things we didn’t clearly understand, since we did not have enough experience. After the Third Plenum of the 11th Central Committee, there were good harvests several years in a row: 1979, 1980, 1981, 1982, 1983, and 1984. The rural areas experienced a new prosperity, in large part because we resolved the issue of “those who farm will have land” by implementing a “rural land contract” policy. The old situation, where farmers were employees of a production team, had changed; farmers began to plant for themselves. The rural energy that was unleashed in those years was magical, beyond what anyone could have imagined. A problem thought to be unsolvable had worked itself out in just a few years’ time. The food situation that was once so grave had turned into a situation where, by 1984, farmers actually had more grain than they could sell. The state grain storehouses were stacked full from the annual procurement program. Two other factors contributed to the change. One was the elevated price of agricultural products. Farmers could make a profit from farming. The other was the reduction in the quotas for mandatory state procurement, which meant taking less food out of the mouths of farmers. For more than two decades, farmers had not had enough to eat after handing over the grains they had produced to the state after every harvest. Of course, the reason that we were able to introduce this new policy was because the Third Plenum of the 11th Central Committee had decided that China could import grains. Comrade Chen Yun said the imports were allowed so that industrial crops could be preserved, but in fact, the imports fulfilled urban consumption demands, thereby reducing the rural mandatory procurement quota [purchased in part for urban markets]. The quantity of grain imports was huge in those years, between 10 million and 20 million tons. Major grain-producing regions could sell their surplus at a higher price and make a profit. Together, all of this gave rural areas instant prosperity. These policy implementations came at a cost. While the prices of agricultural products had gone up, urban food prices could not be immediately raised, since urban workers had limited purchasing power. Therefore we had to finance additional subsidies for agricultural and other rural products. At the same time, foreign currency was needed to import grains, which affected the import of machinery. Plus, urban housing needed to be expanded. And since factories now had more autonomy, the wages and bonuses of the workers were raised. All of this involved additional expenditure. But these things all were part of the recovery process, which paved the way for the good situation of later years. Zhao Ziyang on the "Birdcage Economic Model"
Comrade Hu Yaobang was similarly unenthusiastic about the planned economy. According to my observations, he believed it was the highly concentrated top-down planning model that had limited people’s motivation and creativity and restricted self-initiative at the enterprise and local levels. He believed that building a socialist society entailed allowing people, enterprises, and local governments to act independently, while the state continued to direct and mobilize them with social campaigns. Chen Yun and Li Xiannian, however, emphasized the importance of a planned economy, especially Chen Yun, whose views had not changed since the 1950s. He included the phrase “planned economy as primary, market adjustments as auxiliary” in every speech he gave. The tone of his speeches didn’t change even after reforms were well under way. His view was that dealing with the economy was like raising birds: you cannot hold the birds too tightly, or else they will suffocate, but nor can you let them free, since they will fly away, so the best way is to raise them in a cage. This is the basic idea behind his well-known “Birdcage Economic Model.” He not only believed that China’s first Five-Year Plan was a success, but also, until the end of the 1980s, he believed that a planned economy had transformed the Soviet Union in a few decades from an underdeveloped nation into a powerful one, second only to the United States. He saw this as proof that economic planning could be successful. He believed that the reason China had not done well under a planned economy was mainly the disruption caused by Mao’s policies, compounded by the destructive Cultural Revolution. If things had proceeded as they had in the first Five-Year Plan, the results would have been very positive. In terms of foreign affairs, Chen Yun retained a deep-rooted admiration for the Soviet Union and a distrust of the United States. His outlook was very different from that of Deng Xiaoping, and there was friction between the two. The man who sparked the Green Revolution has just died. Gregg Easterbrook profiled him in the January 1997 issue of The Atlantic Monthly. Here's an excerpt. Borlaug is an eighty-two-year-old plant breeder who for most of the past five decades has lived in developing nations, teaching the techniques of high-yield agriculture. He received the Nobel in 1970, primarily for his work in reversing the food shortages that haunted India and Pakistan in the 1960s. Perhaps more than anyone else, Borlaug is responsible for the fact that throughout the postwar era, except in sub-Saharan Africa, global food production has expanded faster than the human population, averting the mass starvations that were widely predicted -- for example, in the 1967 best seller Famine -- 1975! The form of agriculture that Borlaug preaches may have prevented a billion deaths. Yet although he has led one of the century's most accomplished lives, and done so in a meritorious cause, Borlaug has never received much public recognition in the United States, where it is often said that the young lack heroes to look up to. One reason is that Borlaug's deeds are done in nations remote from the media spotlight: the Western press covers tragedy and strife in poor countries, but has little to say about progress there. Another reason is that Borlaug's mission -- to cause the environment to produce significantly more food -- has come to be seen, at least by some securely affluent commentators, as perhaps better left undone. More food sustains human population growth, which they see as antithetical to the natural world. The Ford and Rockefeller Foundations and the World Bank, once sponsors of his work, have recently given Borlaug the cold shoulder. Funding institutions have also cut support for the International Maize and Wheat Center -- located in Mexico and known by its Spanish acronym, CIMMYT -- where Borlaug helped to develop the high-yield, low-pesticide dwarf wheat upon which a substantial portion of the world's population now depends for sustenance. And though Borlaug's achievements are arguably the greatest that Ford or Rockefeller has ever funded, both foundations have retreated from the last effort of Borlaug's long life: the attempt to bring high-yield agriculture to Africa. Reflecting Western priorities, the debate about whether high-yield agriculture would be good for Africa is currently phrased mostly in environmental terms, not in terms of saving lives. By producing more food from less land, Borlaug argues, high-yield farming will preserve Africa's wild habitats, which are now being depleted by slash-and-burn subsistence agriculture. Opponents argue that inorganic fertilizers and controlled irrigation will bring a new environmental stress to the one continent where the chemical-based approach to food production has yet to catch on. In this debate the moral imperative of food for the world's malnourished -- whether they "should" have been born or not, they must eat -- stands in danger of being forgotten. NORMAN BORLAUG was born in Cresco, Iowa, in 1914. Ideas being tested in Iowa around the time of his boyhood would soon transform the American Midwest into "the world's breadbasket," not only annually increasing total production -- so methodically that the increases were soon taken for granted -- but annually improving yield, growing more bushels of grain from the same amount of land or less. From about 1950 until the 1980s midwestern farmers improved yields by around three percent a year, more than doubling the overall yield through the period. This feat of expansion was so spectacular that some pessimists declared it was a special case that could never be repeated. But it has been done again, since around 1970, in China. Entering college as the Depression began, Borlaug worked for a time in the Northeastern Forestry Service, often with men from the Civilian Conservation Corps, occasionally dropping out of school to earn money to finish his degree in forest management. He passed the civil-service exam and was accepted into the Forest Service, but the job fell through. He then began to pursue a graduate degree in plant pathology. During his studies he did a research project on the movement of spores of rust, a class of fungus that plagues many crops. The project, undertaken when the existence of the jet stream was not yet known, established that rust-spore clouds move internationally in sync with harvest cycles -- a surprising finding at the time. The process opened Borlaug's eyes to the magnitude of the world beyond Iowa's borders. UPDATE: Easterbrook's follow-up in the Wall Street Journal on 16 September is entitled The Man Who Defused the Population Bomb. Labels: Africa, China, economics, food, science, U.S. When Captain Wallis arrived at Matavai Bay in 1767, he assumed that the formidable woman Purea was queen. When Cook came in 1769, he also had the European predilection toward identifying a single ruler. He met with the Otou (Tu), who ascended to the chieftainship of the northwest of the island of Tahiti, in which lies Matavai Bay. According to H. E. Maude, "Cook seems to have been the originator of the myth of Tu's kingship." Tu was accorded favors, gifts, and guns by all subsequent arrivals and from 1790 was acknowledged as King Pomare I.
Pomare was able to extend his territories. He recruited European sailors as mercenaries, including several Bounty mutineers during 1789–1791, and in 1792 the crew of the whaler Matilda wrecked in the Tuamotus, and the crew of the Norfolk grounded at Matavai Bay in 1802. In addition numerous ship deserters and many convicts who escaped from Botany Bay were available. The relative political stability of Tahiti under Pomare I, the apparent abundance of foodstuffs, and the general friendliness of the people came to the attention of Governor King of New South Wales. He studied Cook's account of the islands and received reports from missionaries who arrived in Tahiti during 1797, as well as from whalers calling at Sydney. The penal colony required regular provisions, and following a trial shipment, Governor King dispatched HMS Porpoise in 1801 to obtain salt pork under a formal contract with Pomare I. The king imposed taboos on the consumption of pork by the common people and tried to concentrate all trade through royal channels. In a short time Pomare I emerged as an astute business entrepreneur who recognized the forces of supply and demand in establishing exchange values. His son Otoo (Tu), under the complicated system of inheritance in Tahiti, ascended to power before Pomare died in 1803. Pomare II was less efficient, but more ruthlessly dedicated to the nascent new economic order based on foreign trade. The journal of Captain John Turnbull of the brig Margaret provides accounts of the commercial milieu of the time. The journal gives an understanding of the complexities of the trade and the hazards involved. It thereby shows the difficulties that the chiefly entrepreneurs faced when they entered the established shipping business, despite their strengths from the control of island resources and labor. Wars led by chiefs against the despotism of the Pomares increased in Tahiti. In 1808 Pomare was forced to evacuate Matavai Bay with his forces and take refuge on Moorea Island. The chiefs who now occupied Matavai Bay rashly raided the ship Venus from Port Jackson to obtain cannons. Unlike Pomare, they failed to appreciate that, in order to continue trading with the New South Wales colony, they had to guarantee the safety of vessels. Pomare reiterated such a guarantee from his base in Moorea. This appeared in the Sydney Gazette of 5 May 1810, after the ship Mercury arrived from Moorea. Pomare also made the judicious decision to embrace Christianity in 1812 and obtain the support of the missions. The latter were not only engaged in religious conversions but also traded armaments for food at this time. Captain Thomas Hanson of the mission ship Active even exchanged two cannons for 126 hogs. This account leaves me thinking how little has changed for strong men ruling weak states between 1800 and 2000. Nowadays they trade oil and other natural resources for weapons of all kinds. The master of HMS Dolphin under Captain Wallis in June 1767 was George Robertson. He was typical in many ways of the normal run of career masters [equivalent to Master Chief Petty Officers] in the Royal Navy. Robertson was a good seaman who gave discreet guidance but showed suitable deference to the young gentlemen officers. He was also highly patriotic, with a firm belief in the rights of the British nation to take possession and rule over these "poor ignorant creatures," as he described the Tahitians. In one respect he was less typical than the average master in that he kept a journal of his voyages. This is an important document recording the first relationships between sailors and Tahitians. Robertson's journal describes alternating scenes of violence and friendship. At one stage a large canoe approached, and at a signal its occupants launched a storming of stone missiles. The Dolphin replied with a volley of grapeshot from its great guns. Noting that this "carried all before it and drove [the canoe] in two," Robertson added, "I believe few that were on her escaped with life." The carpenters were also sent ashore and "cut in the middle" some eighty canoes. The attitude of the master was clearly one of exasperation that these "poor creatures" would have the temerity to challenge sailors of the Royal Navy "and put us under the disagreeable necessity of killing a few of them." He was pleased that the Tahitians eventually recognized the error of their ways and that sailors and natives soon "walked arm in arm." The acts of debauching female morals in Tahiti by commerce in iron was echoed by the [HMS Bounty mutineer] bosun's mate James Morrison when he reminded the more high-minded about corresponding effects of gold in his own country, where, he observed, "as fine a woman as any in Europe are said to prefer it to virtue." When Thomas Dyer heads to Afghanistan in December, the former Marine and one-time Southern Baptist pastor won't take a rifle with him. He won't take a Bible, either. Instead, Dyer, a Tennessean National Guardsman from Memphis and the first Buddhist chaplain in the history of the U.S. Army, hopes to bring serenity and calm, honed by months of intensive meditation. That preparation, he says, will help him bring spiritual care in the midst of a war zone. "We're going to put it to the test," Dyer said. Dyer's deployment is another step in the U.S. military's attempt to meet the diverse spiritual needs of America's fighting forces. It's no easy task. For one thing, the military chaplaincy is facing all the complications that have affected American religion over the past 40 years. The decline of mainline Protestants and their aging clergy. The ongoing Catholic priest shortage. The explosion of religious diversity. The emergence of people with no faith. The ease with which people move from one faith to another. The military is trying to adapt to these changes, while trying to find ministers willing to serve in a war zone, and who can minister to American troops without offending Muslim allies. My elder stepbrother is a chaplain in the U.S. Army—and the son of a chaplain. And one of my Southern Baptist missionary "uncles" in Japan became very interested in Japanese Buddhism, later publishing a book entitled Zen Way, Jesus Way. One of his daughters is a believer in Tibetan Buddhism. Whenever Christians ask me why I am not a believer, I usually respond, "In which religion?" UPDATE: There were Christian chaplains in the Imperial Japanese Army, along with Buddhist and Shinto chaplains. (The pastor of the Hiroshima Baptist Church, where my parents served as missionaries, had been a Christian chaplain with the Japanese Army in China.) 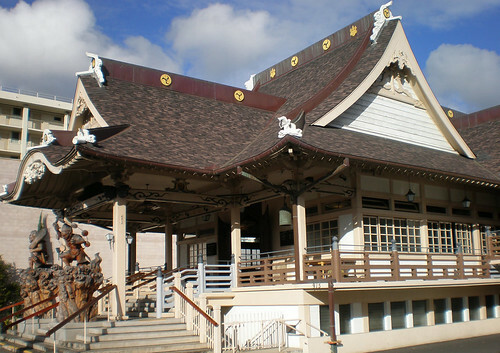 However, there were no Buddhist or Shinto chaplains in the U.S. Army's 442nd Regimental Combat Team, only Protestants, even for all the "Buddhaheads" from Hawai‘i. Danger of "Pooping a Heavy Sea"
Long west-to-east voyages, frequently into the prevailing trades, would inevitably involve extended periods of exhausting tacking or reversing lateens, as these vessels could sail no closer than about 75 degrees to the wind. When running free with a strong following wind and sea, a heavily laden double-hulled vessel required competent handling in adjusting to combinations of wind and sea. Twyning observes that the sea has to be kept on the quarter, for if a high wave was allowed to run between the two hulls, it could part them. Scudding before a gale could also make any of these craft difficult to control, and there was the danger of being overtaken by waves and pooping a heavy sea, which could wash over the length of the vessel. It is likely that experienced seamen would in such weather pay out a long line with buoyant material, such as wooden spars attached to act as a sea anchor, and ride out the storm or drag it astern to slow down, but there is no evidence of this in the Pacific. Some vessels carried a heavy stone on a rope for anchoring.. This could be hung in the water over the bow, then weights shifted aft and the vessel kept nearly head-on to the sea, assisted by expert use of a steering oar. Morrison also observed in Tonga that "when taken by a squall they luff head on to it and shake it out—if long they jump overboard and hang her head to windward till the squall is over." He added that bringing the sail down on very big vessels could be dangerous, but they carried plenty of cordage and masts to repair damage. Calm weather could bring other problems, particularly where strong ocean currents were encountered.... The equatorial current can set in a westerly direction at thirty to forty miles per day, and under fresh trade winds at about three and a half knots. The easterly countercurrent has a rate that reaches over one knot. These currents vary seasonally, with the equatorial countercurrent extending just south of the equator in June and July. Captain G. H. Heyen, who commanded the brigantine Alexa, the last sailing vessel to operate regularly out of Sydney to the Pacific Islands in 1929, recalls becoming becalmed twenty miles west of Tarawa on the fifty-fifth day out of Sydney and drifting away; the Alexa did not reach the Gilberts again for another one hundred days. The map of Suva, with only a few Indian names, reflects the historic alliance between the British and the Fijian chiefs in ruling Fiji and the exclusion of Indo-Fijians from the upper reaches of society for much of the colonial era. None of this might matter if it did not resonate so strikingly with contemporary developments in Fiji. The Fijian nationalist demonstrators who gathered at the Parliament on the morning of May 19, 2000, the day of George Speight's coup, had marched along Victoria Avenue and Ratu Sukuna Road, thoroughfares named after a queen and a chief who had little time for democracy. To live in Suva in the year 2000 was to have a brief glimpse of the abyss of disorder into which political passions threatened to plunge the country. After the riots and looting of May 19th, shattered glass littered the streets, people fled, and buses ceased to run in a city where the bus station is normally crowded with people seeking transport all over the island of Viti Levu. Desperate shopkeepers boarded windows, covered them with heavy mesh, or dumped containers on pavements. The northern end of town resembled a war zone, and for a few days a deathly quiet replaced the normal bustle of Suva's commercial life. A burned-out building near the post office, shown repeatedly on foreign TV, symbolized the depths to which Fiji had sunk. Yet these early days were just the beginning of a crisis that would grip the capital for the next two months, during which Ratu Sir Kamisese Mara was deposed as president, the 1997 constitution was abrogated, the Parliament hosted a bizarre carnival of nationalist posturing, and the army gradually asserted sufficient control to be able to install a government to its liking. The University of the South Pacific is situated close enough to the Parliament for the gun battles of a few streets away to be heard and even felt as reverberating thumps. The vice-chancellor, Esekia Solofa, suspended classes and repatriated students from other countries, including the hapless Solomon Islanders who returned in early June to a far more serious coup in their own country. Suva became a city of curfews, rumors, premature closings, and sudden traffic jams as people fled home on the strength of the latest disturbing report about developments. Foreign journalists, sensing the potential for drama but mostly ignorant of Fiji, poured into town booking hotel rooms and renting cars. Some soon left after an armed mob, enraged by a television interview critical of Speight, invaded Fiji TV on the night of May 28, smashed equipment, and chased journalists into the nearby Suva Centra Hotel. In the hills of Viti Levu the landowners of the catchment area of Monasavu Dam, where hydroelectricity is generated, sabotaged the turbines and seized the opportunity to demand compensation for their loss of resource. As the Fiji Electricity Authority pressed wheezing and outdated diesel generators into service to meet the shortfall, Suva was subjected to rolling blackouts, and people became used to evenings spent in the dark and workdays without power. Since Suva these days is also subject to intermittent breaks in the water supply, sometimes lasting three or four days, life in the city was not only insecure—no one knowing when Speight's crowd of supporters might burst through the roadblocks set up around the Parliamentary area—but also inconvenient in a characteristically Third-World way. Suva was not Kisangani in the Congo or Bulawayo in Zimbabwe, prosperous towns reduced by conflict to penury, but such a fate for the city was no longer beyond imagining. The root of the political unrest was a struggle for power between different groups of Fijians, a reprise in modern form of similar struggles that have characterized Fijian history for centuries. The Indo-Fijians, condemned to be guests in the land of their birth, were the victims not just of Fijian ethnocentrism, but also of Fijian infighting. I should have known all this, having taught Pacific history and politics for years. Why should we be surprised that a liberal, multicultural democracy is so hard to construct in a country whose traditional politics were deeply hierarchical, whose colonial masters perpetuated that hierarchy until independence, whose immigrant population was kept strictly separate during the colonial era, and whose indigenous population continues to think to a greater or lesser extent of those who live in Fiji as divided between vulagi (guests, visitors) and itaukei (hosts, owners)? As Steven Hooper has argued, "an ideology of complementarity, involving at some level the categories chiefs and people, prevails among the majority of Fijians" and still "to a large extent conditions attitudes towards and relations with those people beyond the Land, be they of Indian, European, Chinese, Banaban or other descent." In Henry Rutz's view, most Fijians "see themselves less as citizens of a democratic nation-state than as supporters of a local chief who holds rank in a hierarchy of chiefs from village to 'nation."' Yet the hatreds, intolerance, and disorder unleashed by Speight still came as a shock, and I was brought face-to-face with the depth of my own attachment to order, civility, tolerance, and modernity—the modernity that delivers education, health care, convenience, efficiency, and opportunity to large numbers of people in the developed countries even as it generates inequality and atomization. Fijian tradition, so easy to romanticize, turned out to be a political resource readily exploitable by ambitious politicians and, if allowed to determine events, likely to consign Fiji's people, whatever their race, to a bleak future of stunted lives and restricted opportunities. Having plumbed the depths through the curfews and roadblocks of 2000, Suva suddenly blossomed after the 2001 elections, which returned Fiji to a constitutional and internationally acceptable path. An energetic new Indo-Fijian mayor cleaned up the streets, planted gardens, and reconstructed footpaths. Businesses responded with a burst of refurbishment and repainting, and decorations festooned the streets as Christmas approached. This time, though, no one was under illusions about how difficult it would be to restore long-term political stability and to realize the country's potential. Too many people, especially in the Indo-Fijian community, had had enough. In a sign of the times, scores of thousands of Fiji citizens entered the United States' green card lottery in the hope of winning entry to a country where they would be judged on ability and hard work alone, not on race or inherited status. Nurses in Fiji's hard-pressed hospitals queued up to take jobs somewhere else in the world, from Australia to the United Arab Emirates. 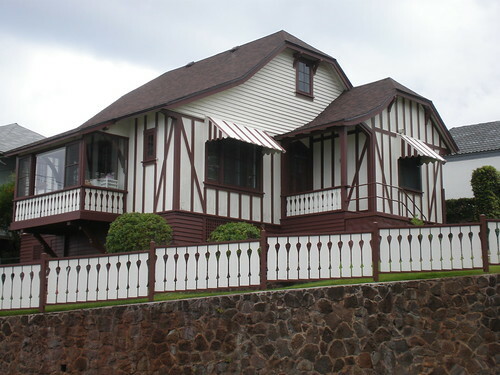 I've finally found a couple of wonderful names for those squashed ends on gable roofs that can be found on some of the Honolulu Tudor–French Norman Cottages I've been documenting for the WikiProject National Register of Historic Places. The most fetchingly archaic-sounding terms are jerkinheads or shreadheads. 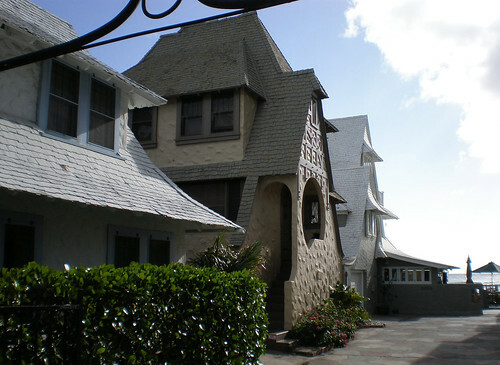 More prosaic (but "hipper") names for them are clipped gables, hipped gables, half-hips or barn-hips. 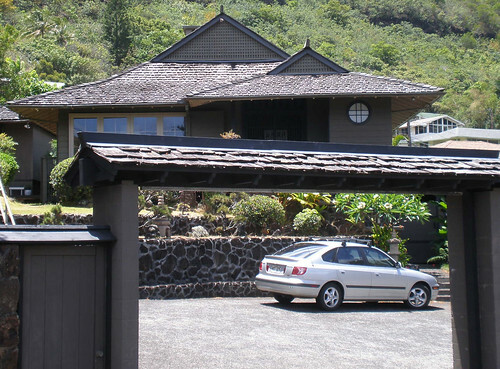 As the Wikipedia hip roof article notes, a half-hip is a hip roof on top of a gable roof, while a gablet roof is a gable on top of a hip roof, like the roof type known as irimoya in Japanese. 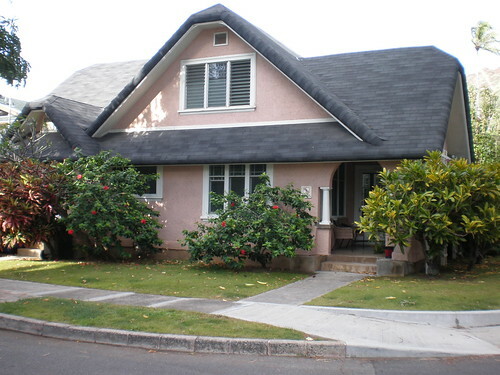 Irimoya roofs can be seen on a lot of the newer homes built in upper Manoa Valley, whose residents are nowadays far more likely to be of East Asian than European descent. Labels: England, Hawai'i, Japan, language, U.S. THE PACIFIC SAILOR who is waiting for a jumbo jet at Nadi International Airport in Fiji has been in transit for almost three days. He has travelled by local boat from his home island of Nanouti in Kiribati to Tarawa, the principal island of Kiribati, and from there by small plane to Fiji. He is bound for Townsville, Australia, via another flight from Sydney to rejoin a large bulk carrier as an AB (able-bodied seaman). The ship will probably be heading next for the United States. It is owned by a German company in Hamburg and flies the Liberian flag. This ship once again will be his home and workplace for the next twelve months. A similar procedure is repeated in various ways throughout Oceania. Some eight thousand or so young men, and a very few young women, move from their home islands to world ports to join foreign-going ships. They are recruited as sailors by agencies of the global labor market and will be sailing worldwide on vessels carrying cargoes of raw materials, oil, chemicals, and consumer goods in containers. Rarely, if ever, will they sight their home islands during these trips. The sailor from Kiribati was born on a small, flat coral atoll close to the equator (0°40' S). The atoll is remote and only twenty-four miles long and ten miles wide. There are nine villages, with a total population of about 3,200. These are subject to drought conditions, when water and island foods are scarce, and survival has depended on sea resources. When growing up, the future sailor was never beyond the sound of the wind and sea, and at an early age he learned to swim, dive, sail, and fish. Few strangers would have come to his village. Only when an interisland vessel came through the boat pass and anchored in the lagoon to unload flour and other goods by workboat would there be any significant changes in the repetitive rhythm of daily life. The boat would load copra off the beach, which is the only cash product on Nanouti and can be depleted during droughts. As a youngster, the I-Kiribati sailor would have known male relatives who returned on leave from foreign-going ships. They would tell sailors' yarns and bring money, radios, perfumes, toys, and other attractive items. These were soon distributed within the extended family through the social obligations of bubuti (sharing on request). Some of the younger unmarried sailors would spend only the minimum time on leave at home. They preferred to return to the company of mariners from other islands who congregated in South Tarawa, with its cinema, cafes, bars, and girls and its distance from the rule of the old men and the eyes of the clergy on their home islands. The Nanouti sailor is following in the footsteps of the itinerant sailors of the past. He is twenty-nine, has qualified at the Marine Training Centre in Tarawa, and has already served three years at sea. He is now a well-paid (by island standards) AB. His young wife and baby daughter have been left on Nanouti, where he has also left part of his personality. From now on, he will adapt to the ways of shipboard life, with its terminology known only to fellow seafarers, its discipline, and its food and customs. He has likewise been transformed in appearance. While on leave on his home island, he lived the relaxed life of a bare-bodied, barefoot villager in a wraparound lavalava. He is now wearing a T-shirt, blue jeans, a baseball cap, sunglasses, and an outsize pair of trainers. He carries a case and a bag, which contain shirts, pullover, socks, underwear, a woollen cap, a boilersuit, boots, shoes, hard hat, oilskins, and a knife, all previously supplied by the company. Onboard discipline is exercised by a German captain and, on deck, three Polish officers. The engine room has similar numbers and nationalities in charge. The cook is from the Philippines; consequently, for the next twelve months he will not eat the "true food" of Kiribati—fish, coconut, and taro, supplemented by bread, rice, tinned meat, and on occasion pig and fowl. Instead the daily diet will be German and Polish dishes cooked by a Filipino. But he is happy that at least six other ratings [see nautical glossary entry below—J.] will be from the islands of Kiribati. He could of course have found himself in a much more ethnically diverse seagoing community. In any event he will be different in many respects from what he was on his home island. Usually there are three departments on a cargo vessel: deck, engine, and catering. Each has three levels of crewings: officers, petty officers, and ratings. On-deck ratings comprise mainly ordinary seamen (OS) and able-bodied seamen (AB); in the engine room they are mainly motormen (MM), firemen, and greasers; and in catering, various assistants. Some of these designations have changed with technology and minimal crewing, but AB and MM have been retained.